Ahh, things have calmed down about here now. I had a lot of fun :). I get along great with kids. Give me a 5 year old little girl and I will talk about princesses, play Barbie's, dress-up, and commiserate about how grown ups eat yucky foods and chicken fingers are where it's at. It's sort of hilarious, because when I was young and my family would go out to eat you could 99% of the time count on my brother ordering chicken fingers and me ordering a burger. Times have changed. I still love burgers, but I'm much more picky about them now, so if being cautious I err on the side of chicken. I love chicken fingers. But...I'm not so into frying food at home, if I'm going to eat something fried I might as well just order it from somewhere. 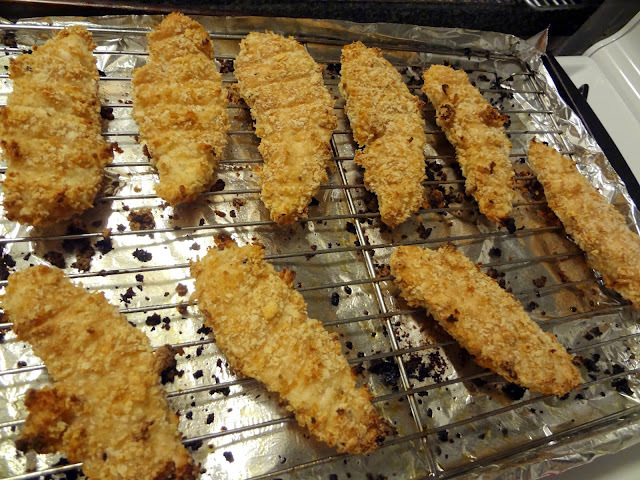 So I've accumulated a few baked chicken tender recipes. These are, so far, my favorite. Jessica is the queen of baked chicken finger recipes! These are crunchy, moist, and the cornflakes really add something special to the flavor. I love these and I suggest-whether you have little ones or just like to eat like one-that you try these. Stat. Slightly adapted from How Sweet It Is' "Crunchy Chicken Fingers"
In a 9 x 13 in. dish, soak chicken in the buttermilk for 2-24 hours. Line a baking sheet with foil. Place a wire rack on the sheet and spray it with cooking spray. In a shallow bowl mix the flour, breadcrumbs, cornflake crumbs, and salt and pepper. Take half of this and set it aside (it's quite likely you won't use all of the amount call for, and this decreases the amount of waste), add more back in as needed. 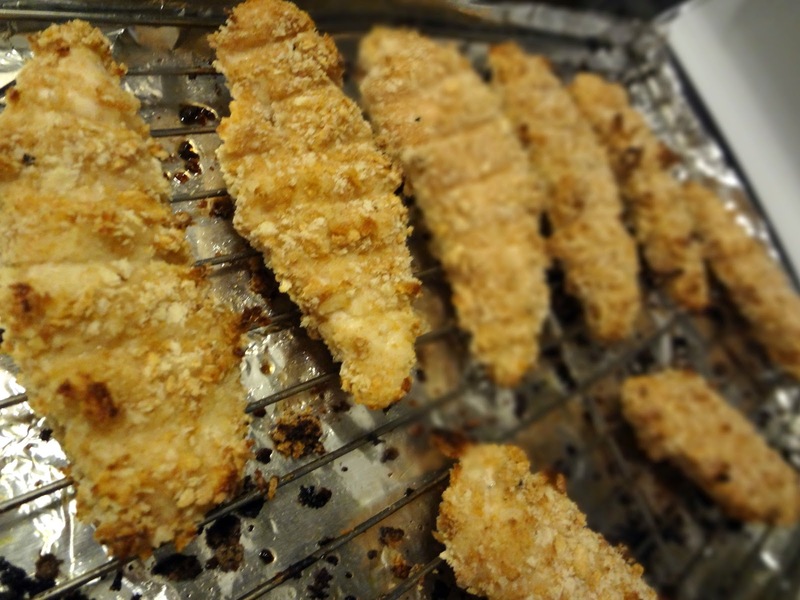 Remove chicken from the buttermilk and coat in the crumb mixture. Place on the rack. Spray each chicken piece lightly with oil-to help them crisp. Bake 12 minutes. Remove from oven and flip all the chicken pieces over. Bake an additional 12 minutes. Allow to cool for a couple minutes, then eat!